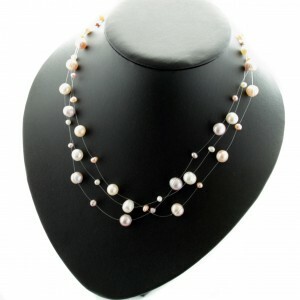 As we head toward summer our attention turns to seasonal fashions and this year, like last year we expect pearl floating illusion necklaces to be a top seller. 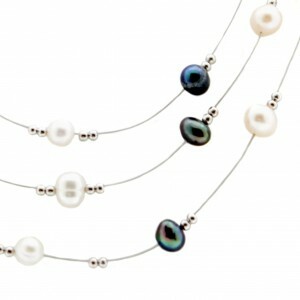 These simple yet elegant necklaces use nylon thread to create the illusion of pearls floating without support. A twist on the floating illusion necklace theme is to use thin wire, rather than nylon, and this stylish version shown above also incorporates silver beads. Our initial collection of floating pearl necklaces is available with white, black or a mix of pastel coloured freshwater pearls. These stylish jewellery designs compliment everyday where or can be used as a statement piece of wedding jewellery, and the beauty of these simple designs is that the necklaces are not expensive, our floating illusion necklaces have an RRP of £29.95 and we have them on offer at just £19.95, so shop early and grab a bargain!